Alzheimer’s doll therapy is a known resource in working with dementia patients. Dolls have been shown repeatedly to soothe and comfort people with Alzheimer. 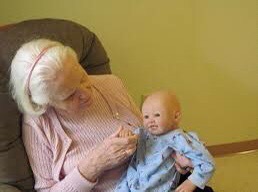 Using a Baby doll can be a very effective way for a person with Alzheimer’s or any kind of dementia to decrease stress and agitation. In a research by Clinical psychologist Ian James and nursing specialist Lorna Mackenzie reported significant improvement in the behaviour of nursing home residents with dementia when dolls were introduced to residents as a choice. The doll users showed an increase in positive behaviour and decrease in negative behaviour and in incidents of aggression since before. Caregivers have reported an increase in quality of life and even that they were able to reduce medication as a result of doll therapy. Though a bit sceptical earlier of the dolls most of the caregivers by the end of the study were fully convinced of its positive effects. A caregiver can use doll therapy for dementia patients as a way to put responsibility, caring and structure back into the lives of those afflicted with Alzheimer’s. Working with a realistic doll has to be introduced to those with Alzheimer’s very carefully. A doll or teddy bear can be seen as a welcoming grandchild or the little sibling of their youth or the Alzheimer’s patient can fear the therapy doll as an unwanted responsibility. 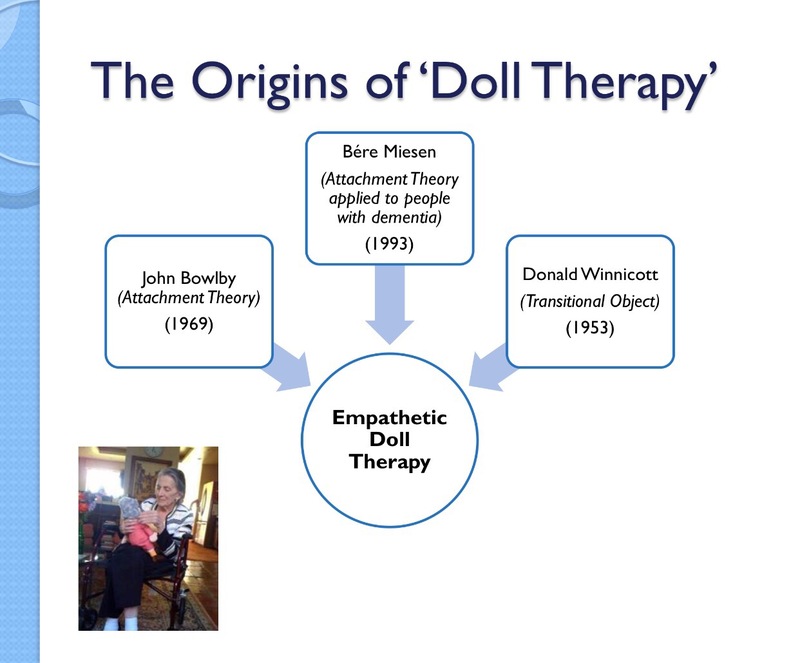 From experience, introducing doll therapy in a controlled atmosphere by allowing the dementia patient to take responsibility rather than giving them the doll to play with, can bring structure to their lives. The Alzheimer’s doll can help a person who is not verbalizing to initiate speech again. It is part of the basic thought process to speak, hum or sing to a baby in your arms. The therapy doll can have its clothes washed, folded and put away and then dressed the next day. The nurturing instinct is strong in humans and which is a big reason as to why doll therapy is so effective. * May reduce of even eliminate the need for certain medications. Despite positive findings there have been some problems using the dolls regarding dispute over ownership of the dolls or some other problems. * In community settings the individual dolls should be clearly identifiable. * A life like baby doll resembling a 6-12 month old baby will have better chance of success. * Never give the patient the doll in hand… Rather leave it around the vicinity for the patient to voluntarily adapt the doll. Allow the individual to choose the responsibility to care for the baby. * The patients think of the doll as live babies so be careful and refer to the doll by its individual name. * It is better to introduce the doll to individuals in earlier or middle dementia stages. 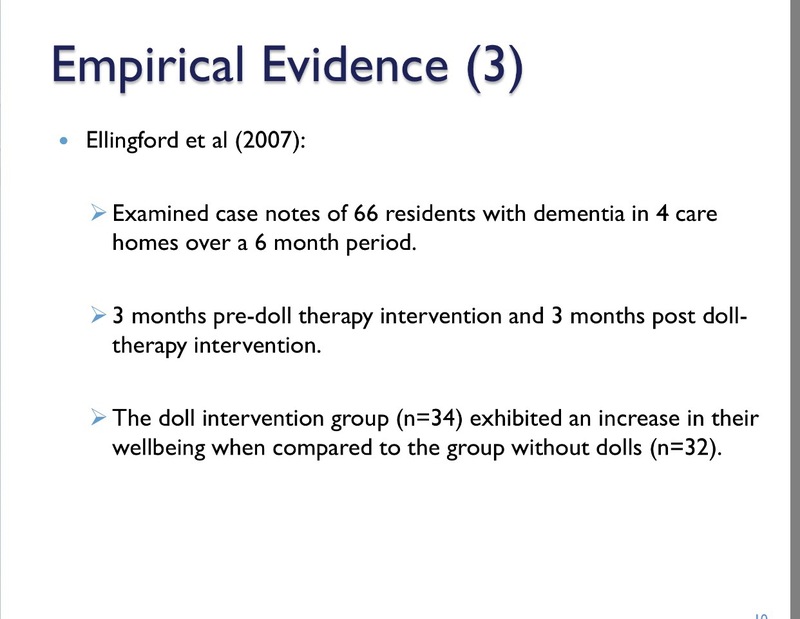 In conclusion we can say that in many people the doll therapy is effective and meaningful intervention for people with dementia. Posted on September 20, 2016 February 23, 2017 by sushme2015Posted in Alzheimer's/DementiaTagged Doll Therapy.